The UWTC-REC4 wireless DIN rail receiver can work with up to 48 wireless transmitters, displaying their data in real time on your PC. The UWTC-REC4 also has four independent analog outputs, which can be user-programmed as a retransmission signal from any input channel, driving a PLC or data logger. The UWTC-REC4 is compatible with the full line of UW wireless transmitters from Omega; choose from RTD, %RH, infrared (non-contact) temperature, pH, as well as process voltage/ current. 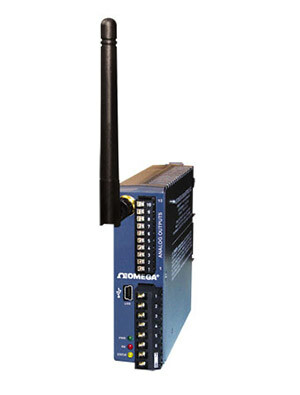 Form a Complete Wireless Measurement and Control System! The standard DIN rail mount design provides for easy mounting, and fast connections to other DIN rail equipment, including PLCs. The optional iDRN-PS-1000 power supply can power up to three UWTC-REC4 units, which can give you up to 144 wireless input channels, and 12 analog outputs. Note: The UWTC-REC4 can be powered directly by the PLC or data logger you are connecting to and will not require an additional power source if the instrument has 12 to 24 Vdc @ 250 mA available for external devices. If your instrument does not have a power source available for external devices you will need to add an additional power supply to power the wireless receiver (iDRN-PS-1000). This power supply can power up to 3 UWTC-REC4 receivers. Comes complete with measurement/data logging software, USB programming cable, and operator's manual. Note: Because of transmission frequency regulations, these products may only be used in the United States, Canada, Europe and China.